The old adage, 'Get the right tool for the right job,' definitely applies in the kitchen. If you want to cook real gourmet food, you need the right tools. There are literally thousands of items available to help you create professional looking pastries, breads and other foods. The trick is wading through all of the possibilities and finding the items that are right for you. While you probably have items like spatulas and omelet pans, there are a few items that will make cooking those amazing gourmet meals a little easier. These items are considered essential cookware for the budding gourmet chef. A high quality set of chef's knives is an imperative addition to your kitchen. A good knife cuts foods quickly and uniformly, allowing you to filet fish and pare vegetables. Poor quality, dull knives are dangerous and make the task at hand much more difficult. Purchase a great set of knives before you purchase anything else. A set of high quality, heavy pans will help you create foods without scorching, burning or cooking them unevenly. Do some research and choose the cookware sets that seem to fit your budget and needs and get the best that you can afford. Whether you are cooking the perfect salmon steak or sautéing a Tilapia filet, a fish spatula is a handy item to have; it will help ensure that the fish makes it to the plate without breaking or sticking. A fish spatula has a longer surface area than a regular spatula, is usually stainless steel and is flexible enough to slide beneath the fish without causing breakage. The slots in the spatula allow oils or poaching liquids to flow back into the pan. Purchase whisks in several styles and sizes for the different types of whisking you need to do. There are special whisks for eggs, whipping cream and other normal kitchen chores. A mandoline is a time saving tool for creating professional looking julienne, French fry and matchstick cuts. There are usually blades for wavy sliced vegetables and blades for other fancy techniques. With a mandoline you can cut uniform, paper thin slices. Be sure to get a good one; the very inexpensive ones often have inferior blades that wear out quickly. A food mill is essential for creating smooth sauces and purées. These handy kitchen gadgets have been in use since before your grandmother's time. A food mill purées and strains food at the same time, allowing you to create things like seedless raspberry coulis, without any extra work. Simply place the mill over a bowl and put the food into it. As you turn the crank, a rotating blade pushes the food through a strainer, leaving seeds, fibers and skins behind. 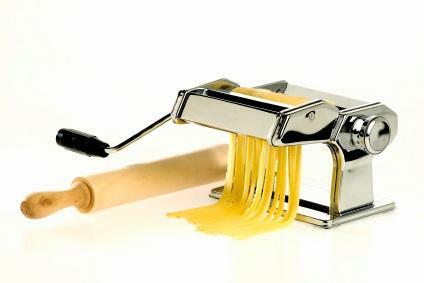 Whether you choose a hand cranked or electric version, a pasta maker is an important part of your kitchen. There is simply nothing you can buy that is as good as fresh, homemade pasta. Use a pasta maker to roll out a variety of sizes and shapes of pasta very thinly and very quickly. It would take an entire book to list all of the tools available to the gourmet cook, and each chef may have a different idea of what is essential for cooking. There are some things that can make cooking easier and help with technique. Consider adding these items to your kitchen. Silpat sheets are reusable, silicone baking sheets to keep cookies and other items from sticking. Madeline pans allow you to create the dainty French Madeline cookies for any occasion. Cooling racks help cool breads and baked goods quickly. A tart pan with a removable bottom can help you make beautiful European-style tarts and remove them from the pan easily. An ice cream maker lets you make your own gourmet ice cream, sorbet and gelato. While your local Target or Walmart may have many cooking and baking supplies, spend some time researching the thousands of gourmet cooking supplies on the Internet. Stores that carry these items include the following. You can also find many gourmet kitchen items in small specialty stores locally. A Google search should help you find stores in your area. For people who enjoy cooking, creating food for their loved ones is more than just filling their bellies; it is a display of love and loyalty. It can be heartbreaking to work for hours over a new recipe only to find that the outcome was less than perfect because the kitchen tools used were cheap or meant for another application. Use the best gourmet cooking supplies you can afford, and find the proper tools for the job at hand to ensure that your creations are every bit as amazing as you hoped they would be.